It’s cold out there, which means that the horseshoe crabs (and most marine animals) have migrated to the deeper warmer waters, awaiting for next year’s spawning season. And as we approach the holiday season, a time to give thanks, we should give thanks to a true blue blood animal. So, I know what you’re thinking: "why are you calling a horseshoe crab a 'blue blood'? Are they noble? They’re just a crab! (According to the American Heritage Dictionary of the English Language, a blue blood is a person of noble or aristocratic descent.) "
Well, I’ll have to disagree (and they’re not a true crab! (See previous blog post)). First and foremost, horseshoe crabs actually have blue blood (so they are TRUE blue bloods). Vertebrates use iron to produce hemoglobin, a protein in red blood cells that transports oxygen throughout the body. The iron is what makes our blood the color red! On the other hand, horseshoe crabs do not have hemoglobin; instead they have hemocyanin, which uses copper to produce their blood. But what makes their blood blue? Think about a U.S. penny - it is made of copper. However when it is exposed to air for a very long time, it starts to turn a bluish-greenish color. That’s why older pennies have a slight blue-color to them. 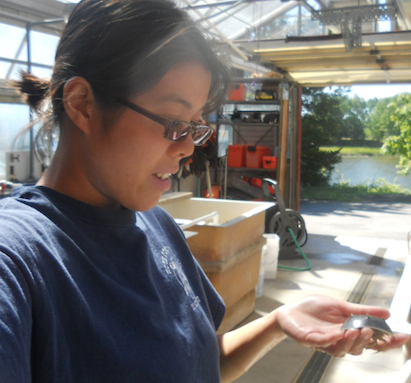 This same reaction applies to horseshoe crabs; when oxygenated, their blood turns blue; pretty wild, right? But why am I focusing on a horseshoe crab’s blue blood so much? Horseshoe crabs play a vital, if little-known and under-appreciated, role in the life of anyone who has received an injectable medication. Horseshoe crab blood is widely used by pharmaceutical, biomedical, and medical device industries to ensure that their products, like intravenous drugs, vaccines, and medical devices, are free of bacterial contamination. What is it about horseshoe crab blood that makes it so great? Well, let’s start from the beginning. Around 60 years ago, intravenous drugs and injectable instruments had to be screened for bacterial contamination and it was done by testing it on rabbits; when injected into rabbits, if the rabbits produced a fever or ailment, the drug or medical instrument had to be rejected. This became an important tool in the pharmaceutical industry. However this was a very a slow process and became very costly. In the 1960′s, scientists found that when common marine bacteria were injected into the bloodstream of the horseshoe crab, massive clotting occurred. They showed that the clotting was due to reaction with an endotoxin, a toxin inside a bacterial cell that could potentially be harmful when released. Later, the scientists were able to localize the clotting phenomenon in the horseshoe crab and found that the animal was virtually unharmed. What these scientists coined Limulus amebocyte lysate, or LAL, was a property in horseshoe crab blood that was essentially protecting the animal. Ever since the discovery of LAL, horseshoe crab blood is used to test for sterility in intravenous drugs and medical instruments to prevent potentially dangerous bacteria from entering our bodies via injections. Pharmaceutical companies needed a fast, easy, and reliable way to make sure that drugs, vaccines, and medical instruments are sterile and free from contamination, and the horseshoe crab blood did just that! So if you’ve ever gone to hospital or a health clinic or a pharmacy, guess what: a horseshoe crab saved you from potential bacterial contamination and fatality. Many say it is their blood that has made the horseshoe crab persist for so long. Unlike mammals, horseshoe crabs lack an immune system. An immune system is made up of special cells, proteins, tissues, and organs that produce antibodies to defend against germs and harmful bacteria, keeping animals healthy. Horseshoe crabs do not have this system and cannot develop antibodies to fight off infection. Instead the LAL in horseshoe crab blood is able to protect the animal and fight off any bacteria, fungi, and viruses. The components of LAL are considered as the horseshoe crab's primitive “immune” system; the LAL not only bind, inactivate, and isolate bacterial endotoxins, but the clot formed as a result of activation by endotoxin, acts as a barrier and prevents excessive bleeding and additional bacterial entry and infection into the horseshoe crab’s internal system. So as scary and creepy-looking as they are, horseshoe crabs pretty noble and pretty darn awesome. They have provided mankind a very important service to public health that many people really don’t appreciate or even know about. Even if one has never seen a horseshoe crab, it certainly has touched almost everyone’s lives.